How to Protect Your Files and Folders in Windows PC? Most versions of Microsoft Windows do not come with any method of protecting your files and folders with a password; however, that is not the only way of protecting your data. Encryption is probably one of the oldest, yet most effective ways of securing your data. For those of you interested in securing your data with password protection, you’d be better off investing in some third-party software, so continue reading for that information. Note: Before securing any data, it’s always best practice to create a backup of it, whether it’s in the form of duplication or within a backup file. As I previously mentioned, Windows Visa/7 and 8 do not come with any feature that would allow you to protect your files using a password, to do that, you would need specialized software. 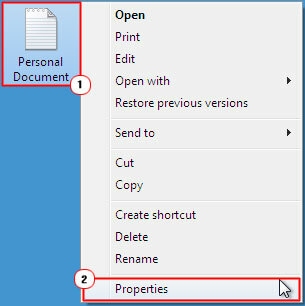 Then right click on the File or Folder (you would like to encrypt) and select Properties. When the File or Folder Properties applet appears, click on the Advanced Button. An Advanced Attributes applet will show up, tick the box next to Encrypt contents to secure data, and then click OK.
Once you’re back on the File or Folder Properties applet, click on OK, to begin the encryption process. Note: If the encryption option is not available, then it means your version of Windows does not support this feature. Your hard drive must be formatted in NTFS at the very least for encryption to work. This encryption method works, by making the data accessible only to those who have your login details. Any other attempt to access your data, whether through another login account on your computer, will result in the data being encrypted, unreadable, inaccessible. The process of encryption on this much older version of Windows is exactly the same as it is on Windows Vista/7/8 and 10. 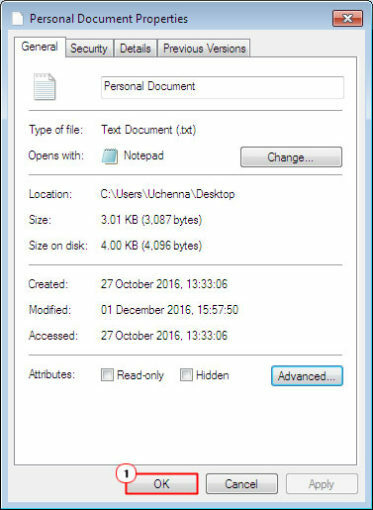 Files and folders that are rarely opened – An effective way of protecting such files is to archive them using one of the many utility tools out there. 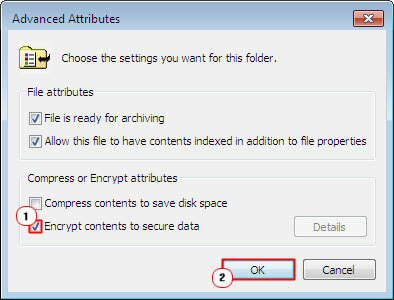 When you archive a batch of files, you can choose whether you would like to encrypt the contents and protect it with a password. Windows XP users – Windows XP comes with its own third-party compression utility tool, which though dated, can be used to password protect and compress files and folders. Windows Vista and 7 users – Both of these versions of Windows come with their own compression tool. However, the compression tool on these operating systems does not support password protection, for that feature you will need to invest in third-party software. There is a way for you to protect certain files from folders on your computer by creating a script which changes the attributes of that folder. This method works by changing the attribute of the folder to a system file, which will make the folder hidden, as all system files are set to hide by default. Thus, the end user can dictate whether or not the folder (containing the files) will be visible. Note: This method does not totally secure your data, as any advanced computer user can very easily change your file settings and make the folder visible. But, if people are unaware of its presence, then it’ll make it difficult for them to locate. 7-Zip: This is a free file and folder compression utility, which includes the ability to protect your files and folders using password protection. This tool also has an array of other features, like the ability to open a number of different file types and to archive your data. WinZip: This is an excellent encryption utility that is widely known amongst the masses. This tool is accessible for free, however, in order to take advantage of all the tools features, you must purchase the full version. This tool does all your usual stuff, compress, protect, encrypt etc, making it one of the very best utility tools around. Folder Guard: This is a commercial password protection utility that allows you to archive and password protect your most important files and folders.